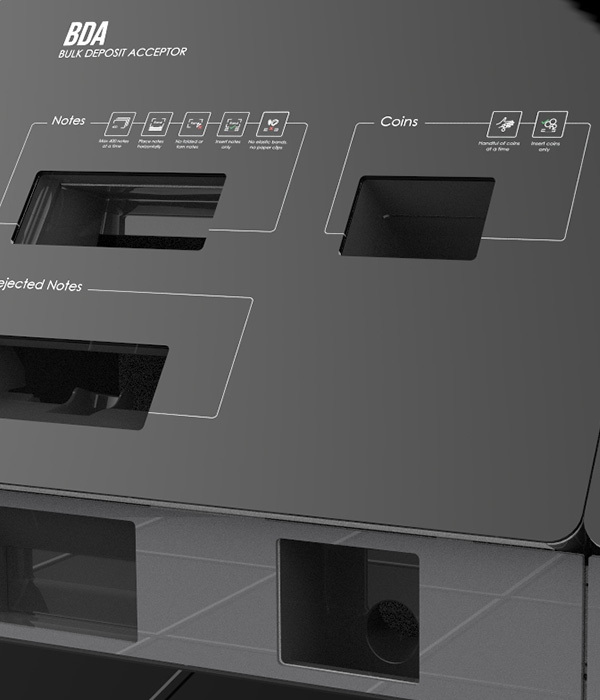 Download the specifications for the Bulk Deposit ATM. Get answers to any questions you may have. Receive a free face-to-face cash management consultation. Receive a quote for your business. Cash Connect announces the launch of South Africa’s first automated solution for bulk deposits - a milestone in enhancing customer service with high-speed, user-friendly, service automation in banking halls. Commercial Banks continue to try and accommodate long queues of people wishing to obtain a multitude of teller services from money transfers to withdrawals and bulk cash deposits. The manual process of accepting cash deposits is costly and time consuming often necessitating multiple reconciliation and counts. The Bulk Deposit ATM (BDA) improves the customer’s banking experience through reducing the time taken to deposit cash. Bulk deposits are effected, on average, 6 times faster than an equivalent manual deposit. The impact on both the depositor and other bank customers is significant while teller productivity is materially improved. Achieving a better return on expensive real estate by realigning branch resources to focus more on upselling and delivery of value based services. Reducing the cost of cash through speed and efficiency of self-service. Removing or reducing the cash management burden and focus from the branch ledger to cash centre. Thanks to the BDA’s 17-inch touchscreen and high speed validator, it’s quick and easy for tellers or customers to process bulk deposits. This solution is designed to be affordable, secure and easy to manage, bringing new levels of convenience into your branch environment. It’s backed up by Cash Connect’s years of experience in secure cash solutions and our extensive support network, including nationwide mobile technicians and 24/7 call centre support. This cost-effective and efficient solution provides a range of optional customisable features that can improve the return on investment for your branch channel. Banknotes - Up to 10 000 notes in a single, disposable bag which is heat-sealed prior to removal. Coins - Up to 20kg of mixed denomination in a single, disposable bag which is heat-sealed prior to removal. Accepts mixed denominations in any orientation. Count speed of up to 800 notes per minute. Note hopper - up to 400 notes capacity. Reject pocket - up to 50 notes capacity. Coin Counter: Count speed - up to 800 coins per minute. Reject pocket - up to 100 coins.